Most people are familiar with the use of crystals in jewellery, such as necklaces, pendants, and rings, but did you know that using larger crystals as home accessories can contribute to an overall sense of well-being and harmony? Not only do crystals make really stunning decorative features, they can also enhance your environment and even clean your space and lift the energies of a room, thereby contributing to a more healthy home. One such stone that is becoming increasingly popular is Selenite. Selenite has a very fine vibration and a kind of ethereal quality. It is said to be excellent for meditation and spiritual work. It can help to bring clarity of mind, introducing a calming and gentle feel to a room. In the current times we live in life seems to be more hectic than ever and after a busy day at work it is often hard to relax and wind down. A large piece of Selenite placed in a room brings a peaceful atmosphere, creating a quiet space for some quality downtime. It is also great in children’s rooms and soothes the atmosphere when tempers are high and helps to settle and solve disagreements. Translucent Selenite is the most commonly used form of this stone and it can be found in a range of shapes: pillars, spars, polished palm stones and eggs, blocks, wands and hearts and even lamps and tea light holders. Not only is it attractive, Selenite also acts as a disperser of energy and works in a supportive capacity offering protection from electro-magnetic smog when placed close to sources of radiation , such as wifi, laptops and computers, TVs and other devices. It helps to create a safe space, protecting from outside influences and is one of the most powerful crystals for the new vibration on Earth. Small pieces can be purchased for as little as £2 as it is easily obtained and found in a number of countries, including the US, Mexico, Russia, Austria, Greece, Poland, Germany, France and even England, though I have not been fortunate to find any myself. One thing to note: Selenite needs to be kept away from damp environments such as bathrooms or kitchens as steam and moisture generally can cause it to dissolve or flake. It is more accurately a chemical sedimentary mineral than a stone, and is only a 2 on the Mohs scale of hardness. If dropped on a hard surface, such as a tiled or stone floor it will likely shatter. Since it is readily available though, it is not difficult to replace in the event of a mishap. What are your favourite crystals? Do share your ideas and experiences. The fact that wool will only smoulder and not burn means it is naturally flame retardant, making it the perfect chemical free eco-friendly choice for upholstery and for creating a healthy home environment, unlike synthetics which can be highly flammable. On top of this the natural fibres absorb dye very easily, deeply and uniformly, without the use of chemicals. Wool is such a versatile fibre as it is soft and light and drapes brilliantly making it ideal for both clothing and soft furnishings, including curtains, cushions, throws and blankets, as well as upholstery and a whole range of accessories such as bags, scarves and much more. The fibres are naturally elastic and will stretch under pressure and then spring back into shape so that anything made from wool will not sag or bag. And on top of that it is also dirt resistant! The fibres have an outer layer of scales that are resistant to dirt and dust penetration, so any stains will sit on top and not embed, making the fabric easier to clean. Soiling is easily removed by gentle washing in warm soapy water. And even though it absorbs moisture, the scales have water repellent properties, perfect for rainy days, and your sofa. Wow! And just when you were thinking it can’t get any better, it does, because wool is also hard wearing. The fibres are strong and less likely to break, and resist piling and snagging, so wool fabrics will look good indefinitely and typically have a longer life span than synthetic fabrics. No wonder fathers used to hand their overcoats down to their oldest sons! What mileage. Great for both your wardrobe and home soft furnishing budget then. Oh and I almost forgot to say, that wool is also a natural insulator, so it keeps us warm! The crimp in the wool fibres mean tiny air pockets heat up when any moisture in the centre of the fibre heats up, thus holding the warmth. This works both in a wool jacket as well as for curtains. And last but not least the acoustic and insulation properties deserve a mention. Wool carpet helps minimise noise levels in the home, while the fibres are also making their mark as insulation for loft spaces and walls, as a natural alternative to petro-chemical derived products for those wishing to become more green. Let us know what you love about wool. Why are Sofas drenched in Fire Retardant Chemicals? Chemicals that are used in household furnishings such as sofas and chairs to inhibit them from catching fire do not work. Some fire retardant materials used over the years may pose serious health risks and have been linked to cancer, neurological deficits, developmental problems and impaired fertility. Most modern household furniture is saturated in flame retardant chemicals which escape from the furniture and settle in dust. That’s particularly dangerous for toddlers, who play on the floor and put things in their mouths. It would appear that our furniture first became full of flame retardants thanks to the tobacco industry. A generation ago, tobacco companies were facing growing pressure to produce fire-safe cigarettes, as so many house fires started with smoldering cigarettes. Flame retardant furniture, rather than safe cigarettes, was put forward as the best way to reduce house fires. Cigarette lobbyists organized an advocacy group which succeeded in covertly manipulating bodies of fire professionals, educators, community activists, burn centers, doctors, fire departments and industry leaders. to push for measures to be introduced. The Citizens for Fire Safety group has only three members, which also happen to be the three major companies that manufacture flame retardants. Surprised? Apparently a prominent burn doctor’s misleading testimony was part of a campaign of deception and distortion on the efficacy of these chemicals. The chemical industry “has disseminated misleading research findings so frequently that they essentially have been adopted as fact,” the authors wrote. So how do we create a more healthy home? Fortunately companies like OEcotextiles are making it possible to furnish a home safely. The new Two Sisters range of natural eco fabrics for soft furnishings is now available in the UK and can be found at www.designercushionsandthrows.co.uk. 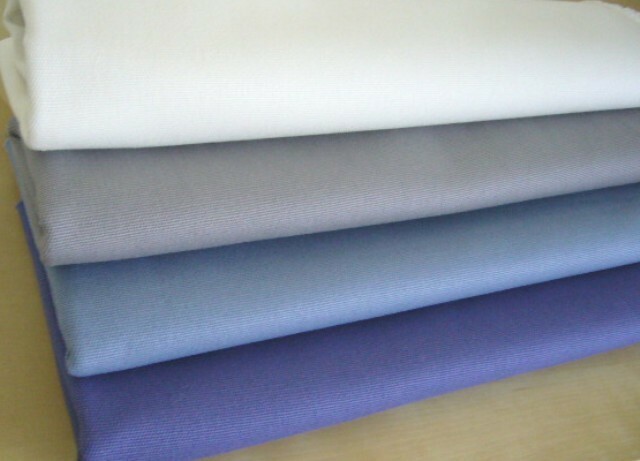 If you are thinking about recovering a sofa or some chairs and want to safeguard your family’s health and well-being, the organic linen and cotton canvas blend upholstery fabric is an exceptional quality weave with tightly twisted yarns that comes in a range of 17 colours, something to complement every design scheme. A while ago I came into possession of an ex-display hanger of samples of wool crewel fabric in a range of 5 different colourways. 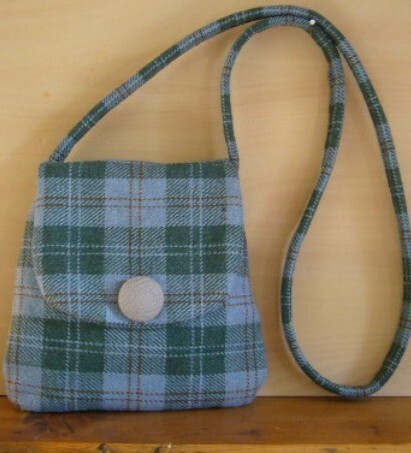 I considered upcycling one piece into a bag, but the heavyweight wool embroidery meant that the cloth was very bulky in places. Then I remembered a piece of hessian that had been lying at the bottom of a basket for a while. And an idea was born for a rug and an eco-friendly project. Here’s how. First of all make a template 5” x 5” and then cut the fabric up into squares. Alternatively, choose a size that will mean you can cut the maximum amount of squares out across the width of the cloth you have available. If you have one, use an overlocker to stop the edges from fraying. If you don’t have a machine, it is not too serious if the fabric you are going to use does not fray too badly as you will be sewing on a backing to give the rug more substance and durability. Begin by arranging the squares in such a way that the colours and shapes are well distributed across the whole area of the rug giving it some form of cohesion. 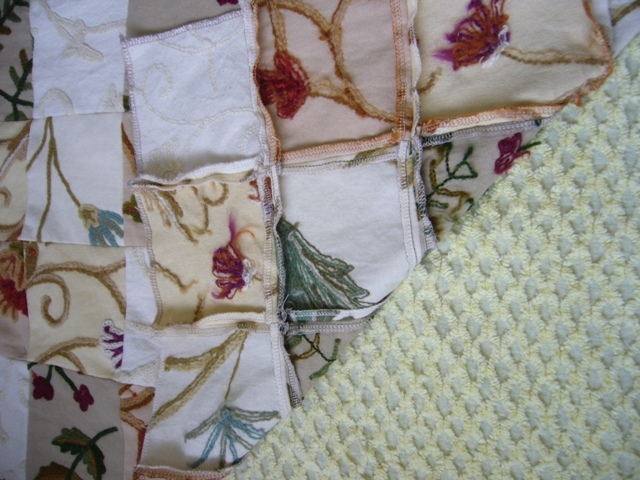 When you are satisfied with the layout, begin sewing the squares together a row at a time. Press all the seams open in each row either as you go or all together at the end. Then begin joining the rows together, matching the seams carefully by placing pins at a vertical angle into the seams so that they stay well matched up and can’t slip or move while sewing together. Next some batting – I used part of an old candlewick bedspread. You could use batting, or curtain interlining, or an old blanket. Baste (or tack) the backing carefully to the patchwork taking care that all the seams remain open. 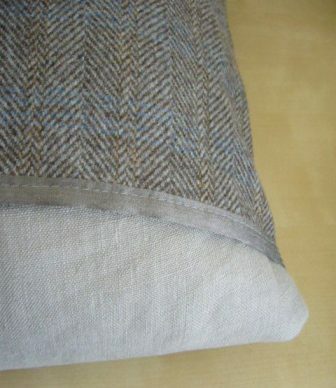 Pin a piece of hessian to the batting side of the work and then baste all three layers together. Trim off any excess hessian at the edges. 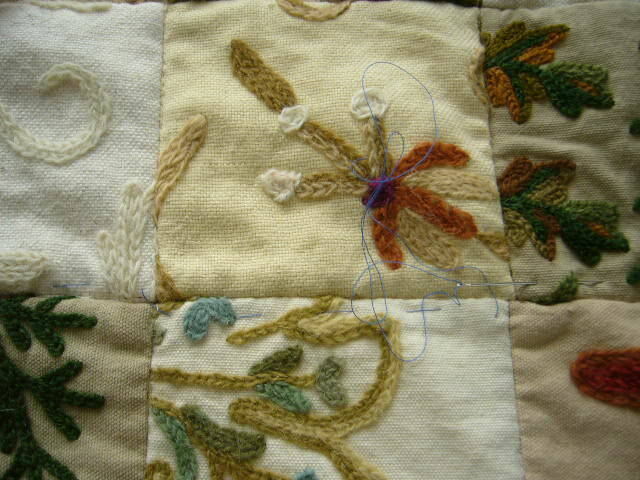 Secure the hessian to the patchwork and batting by sewing through all layers in a large stitch. 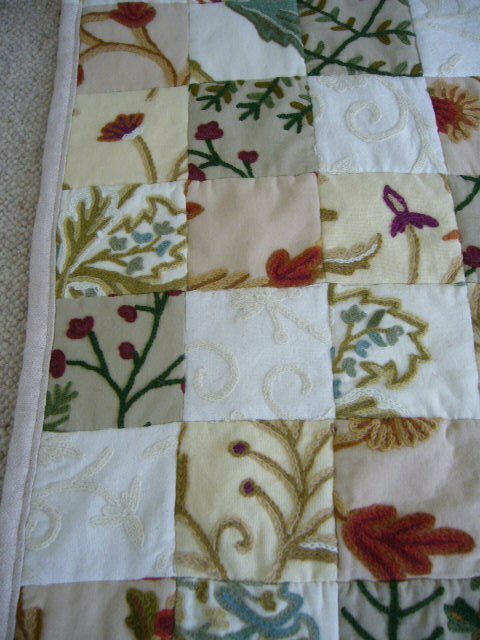 You can either sew in straight lines top to bottom or left to right sewing between the joins (stitch in the ditch) or you can zig zag across. 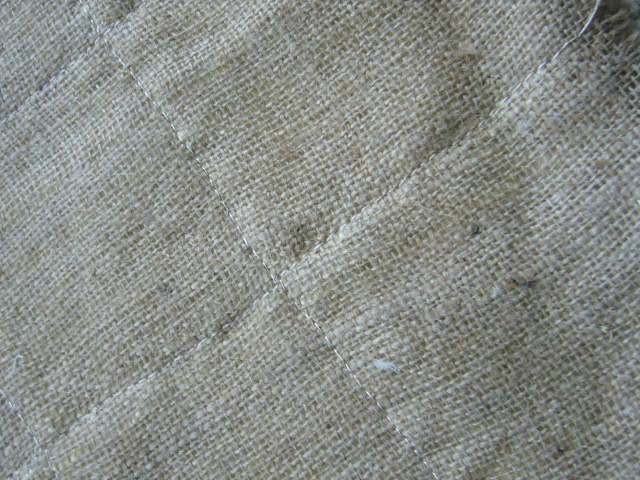 Ideally start from the centre and work out to the top and bottom and sides always taking care that there are no folds and smoothing the base fabric (hessian) regularly as necessary. Bind edges with heavy duty fabric tape or strips of fabric precut to fit, cutting pieces to fit two opposite sides first and once these are in place measuring across the whole width including the border to get the final length for the two remaining side, plus about 1” extra to turn under for a neat edge. 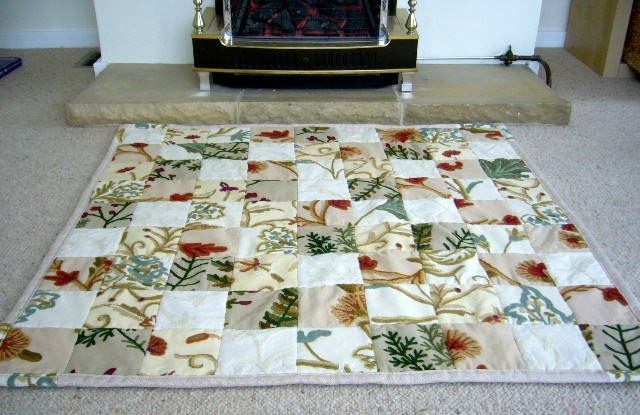 Creating a patchwork is quite a fast way to make a rug and means there are no raw edges which works better for fabrics that fray easily, or that are very soft. 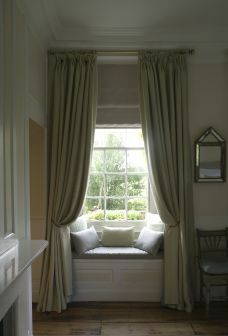 It also great if you’ve got natural fabrics and helps create a healthy home and contributes to low impact living. Please do share any ideas you have or improvements to the technique above. It would be lovely to start a discussion and sharing platform for creative ideas and projects. Do you have allergies to feathers or dust mites? Do you prefer natural fibres to fibres derived from petro chemicals? Do you look for quality products that last, rather than something that has to be replaced every 6-12 months? 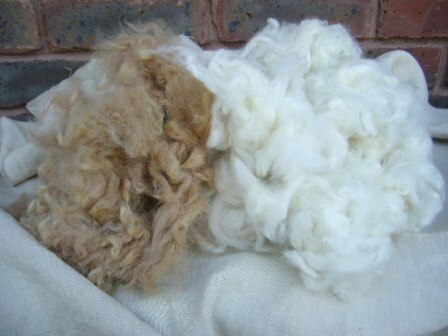 Cushion inner pads in 100% natural Alpaca wool could be an alternative. Looking for ways around dependence on the oil industry and also to reduce carbon footprint of the business I came across locally based Spring Farm Alpacas. A visit to the farm introduced me to these delightful animals whose wool is naturally soft and cuddly, and it rapidly became obvious that the high standards of animal husbandry at Spring Farm ensure that their herd’s fleeces are exceptionally lustrous and full of bounce. Wool is naturally flame retardant and does not need to be treated with any chemicals therefore making it an ideal material for people who experience allergic reactions to a wide range of substances in the home. In addition, Alpaca wool is said to be particularly hypo-allergenic. Test driving the cushion inners throughout the cold winter months revealed that not only are the fillers soft and comfy, but they also bring a warm glow to the back on cooler evenings. Using organic cotton for the covers completes the chemical free experience. I have started with cushion fillers in 16″ size as this is the most popular. However, any size could be made to order. Using textiles and fibres in the home that are free of chemical additives is particularly beneficial where there are young children or a small baby. There are hidden pollutants in many furnishings. 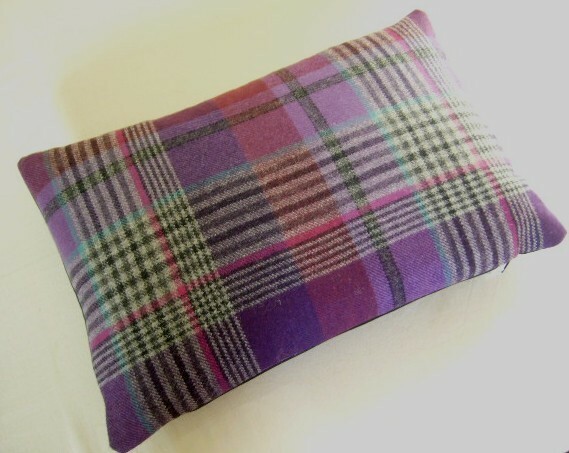 Or if you just want to become more green and move away from products dependent on the oil industry, towards things that are renewable and biodegradable, then choosing wool fillers and cushion covers in natural fabrics such as organic hemp, linen and wool will help to put you on the road to a healthy home. The fact that we are all now striving to reduce our heating costs by increasing our levels of insulation, installing double glazing to make our houses airtight, and that we barely open a window in the winter months means that we are suffocating in a toxic brew that is almost certainly endangering our health. Each individual regulation on its own may well be under the limit when tested, but when you add the cocktail together the results are staggering! And it’s not just sensitive adults, what about children and young babies? It is quite usual that in the excitement of welcoming a new baby into the world we often choose to decorate the room in preparation for the new arrival. This may just be the worst thing we could do. Offgasing from chemicals in new furnishings can be a source of respiratory irritants and more. On top of carpets, sofas and upholstered chairs being treated with flame retardant chemicals, and curtains often being treated with formaldehyde to make them crease resistant or containing residues of heavy metals (read more in our post of 6.12.2009 https://888lorna.wordpress.com/2009/12/01/eco-for-health/ ), bedlinen and clothing are often impregnated to make them ‘easy care’. Are these combined levels of airborne pollutants really safe? I recently came across an article about the potential harmful effect of chemicals on children’s hormones through plastics and skincare products http://greenpeopleorganicskincare.blogspot.com/2009/11/home-life-may-be-affecting-childrens-hormones Just what are we exposing our children to? We’d love to hear your comments or your experiences.